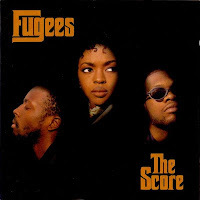 I finally bought a copy of The Score by The Fugees. For a dollar at a library book sale no less. Listening to the album now in 2011, the beats and rhymes seem so quaint and...organic. Lauryn, before she allegedly went batshit crazy. Wyclef, before he sunk deeper into irrelevancy, especially after ruining last year's remake of "We Are The World." And that other guy...whoever he is. As the CD jumps to "Fu-Gee-La," I'm transported back to my sophomore year dance at Iona Prep, grinding and getting my proverbial groove on in the school cafeteria which had been turned into a nightclub with vending machines, the scent of lunchmeat lingering above a throng of 15- and 16-year-olds dressed to the nines in baggy jeans, Tommy Hilfiger tees, and Air Jordans.